Unfold the pastry sheet on a lightly floured surface. Roll the pastry sheet into a 14x10-inch rectangle. Cut out 12 (3 1/2-inch) hearts using a cutter. Place the cut-outs onto a baking sheet. 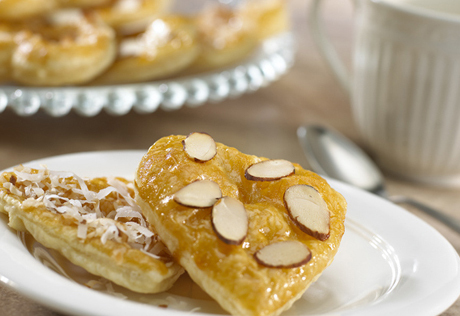 Brush with the caramel topping and sprinkle with the almonds. Bake for 10 minutes or until the cookies are golden brown. Remove the cookies from the baking sheet and let cool on a wire rack for 20 minutes. Walnut-Orange Hearts: Substitute orange marmalade for the caramel topping and chopped walnuts for the almonds. Ice Cream Hearts: Omit the caramel topping and almonds. Sprinkle the unbaked pastry hearts with 2 tablespoons sugar. Bake and cool as directed. Split the pastries into 2 layers. Place a small scoop of ice cream onto each bottom pastry layer and top with the top pastry layer. Drizzle with melted chocolate, if desired.